Hike the popular Monarch Lake trail just south of Lake Granby to explore a 4-mile stretch of beautiful Colorado wildflowers that bloom alongside the forest. Offering incredible views of the lake, this easy trail is perfect for the whole family, including your (leashed) four-legged friends. Keep your eyes open for moose and other wildlife while you saunter along this trail at your own pace. Find it: Head north on U.S. Highway 34 for about six miles, then turn east to County Road (CR) 6 (Arapaho Bay Road/NFSR 125), and drive 10 miles to the trail head parking. The East Inlet Trail is the best wildflower hike on the west side of Rocky Mountain National Park. Not only is it one of the quieter, lighter trafficked trails in the park, but it also offers the option to go for a shorter, 3-mile out and back hike or up to about 15 miles out and back, depending on your group's ability or preference. Expect views of high-mountain lakes, nearby peaks, rivers and views of Rocky Mountain National Park. Start your hike at the East Portal Trailhead, then head towards Adam's Falls. Take your time, and appreciate the falls before continuing onto the East Inlet Trail past a meadow filled with wildflower blooms. You can turn back here or keep going to Lone Pine Lake, Spirit Lake, and Lake Verna, but either way, keep your eyes open—you're in moose country! Find it: Head toward the east side of Grand Lake, past West Portal, and to the East Inlet Trailhead. Devil’s Thumb is a more strenuous, (leashed) dog-friendly hike through high mountain meadows, subalpine, timberline and above-timberline terrain. Views are ever-changing along the way, offering glimpses of Mt. Neva, Devil’s Thumb, Rollins Pass, and the town of Tabernash. Be sure to keep your eyes open in the wildflower-filled meadows and along the aspen trees throughout the hike for wildlife like beavers, deer, elk, or even bears! Be prepared for unique photo opportunities at the top, which offers 360-degree views of your breathtaking surroundings. Find it: At the north end of the town of Fraser on US 40, between mile markers 226 and 227 is County Road 8. Turn onto CR 8 and follow this road for 6.4 miles. CR 8 turns into a good single lane dirt road and becomes USFR 128 (Water Board Road). Turn left and continue for 1.1 miles where the road ends at a spillway and park at the trailhead. This is a moderate hike located across from Winter Park Resort towards James Peak. The trail is accessible all year long, and it's extremely popular for snowshoers in the wintertime. However, if you're looking for wildflowers, the best time to hike it is in the late spring and summer months. The hike meanders through a heavy lodge pole pine forest, following the creek and offering many wildflower, aspen and even moose encounters! Find it: Access the Jim Creek Trial from the Discovery Trail Trailhead in the Bonfils Stanto Outdoor Center, across from Winter Park Resort off of Highway 40. The East Shore Trail is a short, 3-mile section of the larger Continental Divide Scenic Trail. This quiet section follows the Colorado River between Shadow Mountain Lake and Lake Granby, but you can continue hiking the Continental Divide Scenic Trail for longer if desired. On this short stretch of trail, hikers can try to count up to about 90 wildflower species between late June to early July, when the meadows are the most fertile, but there are often blooms from June all the way through August. In addition to enjoying the sea of blooms, take in views of the Colorado River, Grand Bay, mountain lakes, creeks and meadows. Keep your eyes open for wildlife including marmots, moose, elk, and, if you're lucky, an occasional eagle! Find it: From the town of Granby, head to the south end of Lake Granby on Highway 34 and Forest Road 125. Follow the road to the Arapaho Bay Campground, and find the trailhead at the northwest end of the parking lot. The Columbine Lake hike follows an old jeep road until it reaches a junction with the Caribou Pass Trail at 1.7 miles. As the Caribou Trail splits away, stay to the right to remain on the Columbine Lake Trail. The trail continues along the creek to its source at Columbine Lake. This tree-lined lake is nestled in a steep basin on the northwest face of Mount Neva, and it's a great place to take in views of the Indian Peaks Wilderness. Hike the trail late June-July for the best wildflowers. The trail is perfect for a stroll, birding, or other wildlife viewing, and it's dog-friendly! Find it: This beautiful hike is accessed at the Junco Lake Trailhead northeast of Winter Park off Highway 40, 1 mile south of Tabernash and 4 miles north of Fraser. Follow Meadow Creek Road east to the north end of Meadow Creek Reservoir, where you will find the Junco Lake Trailhead. The Elk Mountain Trail is located near the town of Hot Sulphur Springs, where it cuts through the Arapahoe National Forest. Take in great views of nearby Rocky Mountain National Park while strolling through wildflowers on this easy-going hike. This trail is also an incredible place for birding and other wildlife viewing. The area becomes popular during hunting season, so wear orange and check on the hunting schedule before heading out in September and October. Find it: Find the Elk Mountain trailhead off of Forest Road 112, 8 miles west of Highway 125. 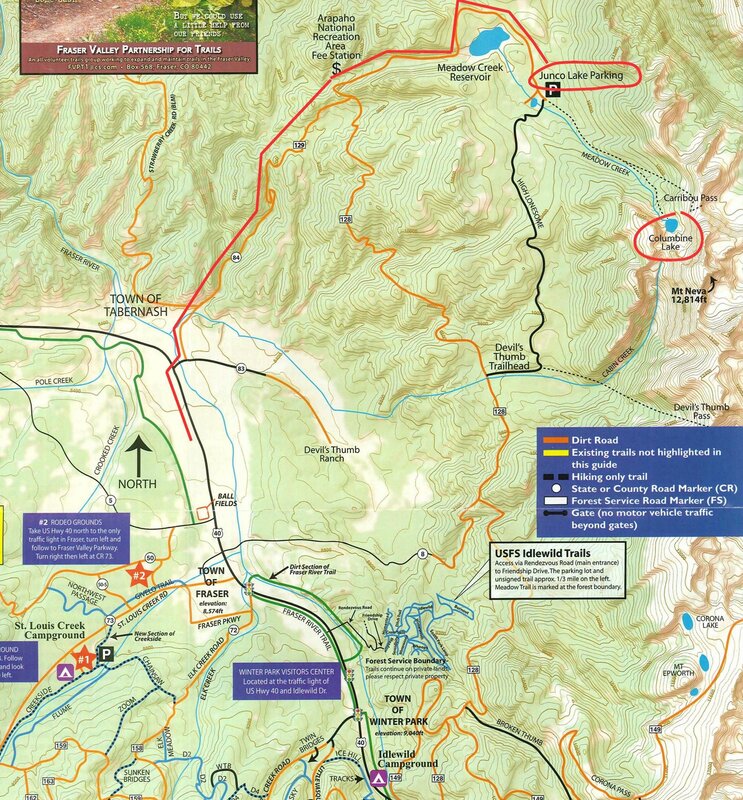 The trailhead will be on Forest Road 112 on the right-hand side. Looking for more? Find more trails in Grand County, Colorado.